3/8" ID x 1/2" OD x .062" Wall ALTAFLUOR® 100 PTFE Tubing | U.S. 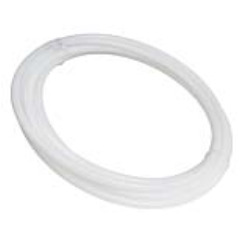 Plastic Corp.
ALTAFLUOR® 100 PTFE has the broadest temperature range of any fluoropolymer and can resist highly corrosive liquids and gases even at elevated temperatures. It is ideal for applications like laboratory, chemical process, analytical and process equipment, automotive, cryogenic, electrical and high temperature applications. ALTAFLUOR® 100 is compatible with most standard fittings (not suitable for use with flare-type fittings).